The Guardian released its list of 1000 novels everyone must read. The exhaustive list is divided into several different genres and includes an intriguing science fiction and fantasy selection. The list contains all the usual suspects like Ursula K. Le Guin, Ray Bradbury and Dan Simmons but it is replete with books you might not think of as SF/F. With names like Kafka, Doris Lessing and Herman Hesse in the mix the list definitely leans more towards the literary side of the aisle than most SF/F lists out there. 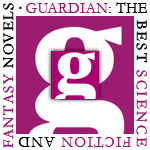 Be sure to visit guardian.co.uk for more information including a brief intro to each of the novels that made the list.